Objective: You do NOT challenge the Queen. Objective completed: Thursday will recover in time but, for Raven, Neron, and Chaney, the danger of discovery before a cure can be found is huge. Access to Blood and Roses (Shop). Raven: I only hope we make it in time to stop Frydae and save Thursday! Chaney: Don't wiggle around, please. Safiria: You got there just in time, <Character>. Thursday will be weak for several months as her body and blood recovers but she'll live. Safiria: Darkovia has long been torn by strife. As long as I and my children have tread this earth we've been hunted. Safiria: And you dared to make it your castle... dared to kill and attack your adopted brethren... dared to drink from your own descendant. Safiria: The one who could bring all of Darkovia together! 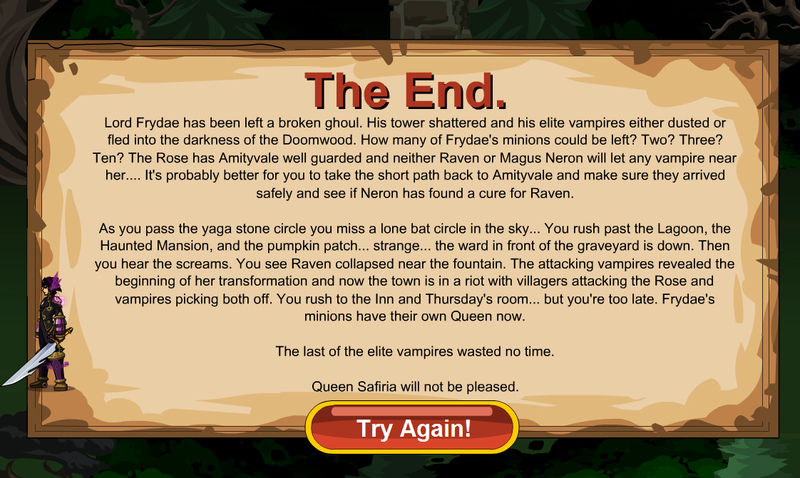 Safiria: You dared to challenge the Queen of Vampires! Safiria: He will never stop trying to hurt you. He will always be a threat. Safiria: Yes... this might be more... appropriate. You are no longer a vampire. You are a worm. The Light rune that marks you means that no creature of darkness will ever come to your aid. No vampire nest will ever welcome you again. Your fangs will rest in my castle and you will have to hunt creatures as low as yourself to tear apart to feed on like the animal you are. Your black heart is now mine and, as long as I hold it, you will live on, a wandering wretch, as Darkovia rises again, with no place for the likes of you! Safiria: We must go back to my castle, my dear, so you can be safe while you heal. Safiria: You will not be safe there. Safiria: You left your necklace at the castle. Safiria: I must go. I will have to entrust your safety to your friends. For now. Safiria: Those that followed Frydae that escaped... they will find no home in Darkovia as long as I rule. Safiria: They will be the first to come for her... if you don't find them first. <Character>: Can you get Thursday to Amityvale safely? Raven: Any vampire that tries to stop us is dust. Go to Amityvale - The End. Hunt Vampires in the Woods - Dismisses the buttons. You walk north. Magus Neron: I won't stop looking for a cure, Raven, but... you won't be able to stay in Amityvale during the full moon. <Character>: You're going to just kick her out? Magus Neron: I'm trying to keep her safe. The townspeople won't accept a werewolf in town, nor will many of the Rose soldiers stationed here. Magus Neron: If she happens to be sent on a quest while the moon is full.... We may be able to avoid a... confrontation until I find a cure. Magus Neron: Chaney is still trying as well. Raven could be an emissary between our labs and help us work together to find the cure faster. Raven: If it will help with your mission, I can do it. Magus Neron: You're already starting to look a little wolfish, soldier. Go rest and eat. Tonight is the full moon and you'll need to head out before it waxes full. Raven: Thank you, <Character>, you are a true hero. <Character>: You're taking a huge risk, Magus... will Raven or Thursday be safe with the Rose? Lon and Chaney? Magus Neron: I can only try <Character>. Raven and Thursday are both in danger. I think we all are. Magus Neron: ... for magic to harm those that I care about is too great. I still believe that Lore would be better off... safer... without magic. Magus Neron: And now... now she's in as much danger from The Rose as she is from the magic in the world. <Character>: And if she gets sent to Swordhaven? <Character>: By experimenting on them! Magus Neron: Jaania? No... it's hard to explain. Magus Neron: Akanthus... Akanthus is different. Magus Neron: I can... understand his... aversion to magic with the stories he told of the southern continent but his methods are... archaic. Magus Neron: ... humongous elemental titans, and dragons that wreaked havoc across the country side. Magus Neron: He watched as his parents were consumed by fire and almost died himself... it's why he never takes off his helm. Magus Neron: ... which is why Raven can never be sent to Espina Rosa. Magus Neron: I think you've only dealt with the thorns. I would recommend... going incognito though.